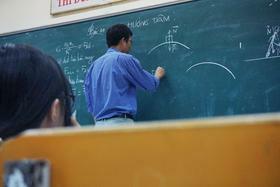 Florida is facing a teacher shortage that stakeholders say is a growing problem. State Department of Education data for this school year shows nearly 3,300 teacher vacancies across the state. The State Education Board has published its list showing public schools’ critical teacher shortages in various subjects. English and reading, math and science, and technical education all make the list. And, shortages of teachers in English for speakers of other languages, and exceptional student education are a concern. Escambia County Superintendent Malcolm Thomas spoke to the board about a problem he says is felt in every Florida school district. Andy Tuck, The State Board’s vice chair, says differentiated pay might be one way to lure teachers for subjects with the greatest need. Board Chair Marva Johnson said DOE’s new leadership may entertain the idea. Wednesday’s meeting was the first with Commissioner Richard Corcoran, former Republican House Speaker, at the helm. Florida's newly hired education commissioner is getting paid nearly $300,000.